Tinkering with your arduino embedded controller and not sure which shields to buy? 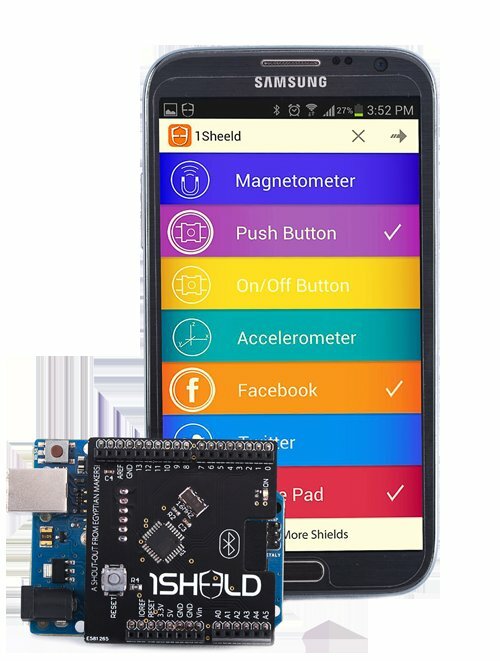 1Sheeld is an arduino shield that lets you use your android smartphone and its capabilities (LCD, touchscreen, sensors, network) in your arduino projects and avoid actually having to buy individual arduino shields - allowing tinkers and hobbyists to quickly get up and running without considerable financial investment upfront. After a successful kickstarter campaign - the devices are already shipping and available. They offer a number of different virtual shields including social network integration (facebook, twitter and foursquare) and basic communication methods (email and sms) that opens up a lot of possibilities. The communication between the shield and the android smartphone is over Bluetooth 2.1 and has a limited range of 10 metres - mainly due to cost considerations. It will be interesting to see if it is possible to combine the 1sheeld with another shield like a Gameduino to make the android smartphone a remote game-pad controller to extend some of the earlier tinkering I did with arduino Frogger concept. Here is an updated Controller class for use with the 1Sheeld - look at how simple that was. They claim once prototyping is done you can use official shields with little code modification.